Ally-Jane Grossan, co-editor of How to Write About Music, shares advice on the art of writing an album review – including tips from the experts and an exercise to help you construct your own. Music writing is something that cannot be taught, so in a sense editing a book called How to Write About Music is a pointless exercise. Still, while you can’t instruct someone how to write beautiful prose about this melodious art form, you can inspire, shape and structure lessons to prompt the reader to write something about music. As Rick Moody states in his timely foreword to the book: “Among the many differences between the music writing of the seventies, let’s say, and the music writing of our own time, is the lack of a prevailing format.” He’s right! In the twenty-first century there are hundreds of magazines, thousands of music blogs, YouTube channels, newspapers, etc. all clamoring for well-written reviews, think pieces and musings on popular and not-so-popular music. There are no longer strict word count restrictions when writing for a website; the possibilities are endless and that’s daunting. Yet while so much has changed in the way we listen to and consume music, the basic concept of an album remains the same. Thus, the exercise of describing and critiquing an album is still a very valid and sought after form of music writing. Listen often – but don’t overthink! Album reviews should not be limited to music you know you love or know you hate. Challenge yourself to explore the unknown. Write a review of an album that you know absolutely nothing about by an artist you have never even heard of, music that has never crossed your path before. Try looking to genres you are unfamiliar with. Write an album review of approximately 1000 words that describes your impressions of an album by an artist you are completely unfamiliar with. How to find an album you’ve never heard of? Go outside. Go to a record store, library, Goodwill or garage sale and find something that catches your eye. Maybe it’s the album artwork that draws you in. Maybe it’s a band name. If exploring in the real world isn’t an option, dig on iTunes, Spotify, Pandora or other sites. First listen to the record from start to finish at least twice and begin to write down your first impressions. How does it feel? What does it sound like? What does it remind you of? Then write up your notes into a short paragraph that just describes the music. Okay, now you can Google. Use the incredibly vast resources available to you to find out about this artist. Where are they located? What’s their story? Now revisit the paragraph you wrote about the music and combine what you’ve learned about the artist with your first impressions. 1. How will you succinctly introduce this record? 2. How does this record fit within its genre or, more broadly, pop or rock history? 3. Where would you want to listen to this record? If writing about music is like dancing about architecture, you'd do best to hone your chops and avoid clichés (like the one that begins this sentence) by learning from the prime movers. How to Write About Music offers a selection of the best writers on what is perhaps our most universally beloved art form. 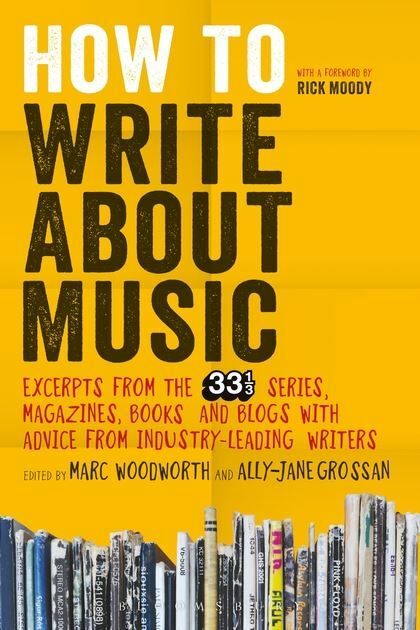 Selections from the critically-acclaimed 33 1/3 series appear alongside new interviews and insights from authors like Lester Bangs, Chuck Klosterman, Owen Pallet, Ann Powers and Alex Ross. To find out more about the book then visit the store page, or the website. Find out more about titles and buy the latest releases from Ally-Jane Grossan at Bloomsbury.com.